In the third post in our series, we focus on how to build processes into your customer relationship management software. It's easier than it sounds. So far in this series on CRM technology utilization, we’ve talked about where most people start A 5-Step Process to Utilize Your Existing Technology: Level 1—All in Your Head) and transitioning to defined and consistent checklist based processes (A 5-Step Process to Utilize Your Existing Technology: Level 2—Make a Checklist). Now that you’ve put your processes into the checklist form and gotten buy-in from your user team, it is time to really start leveraging the power of the CRM tool in which you’ve invested. Building processes into CRM may sound daunting, but the truth is that you did the really hard work when you built out the checklists and got agreement on your processes with your team in Level 2. Most CRM systems are designed to have process and workflows built into them and have a relatively user-friendly interface. So with well-defined process steps and clearly articulated order of events, embedding them into CRM becomes relatively easy. 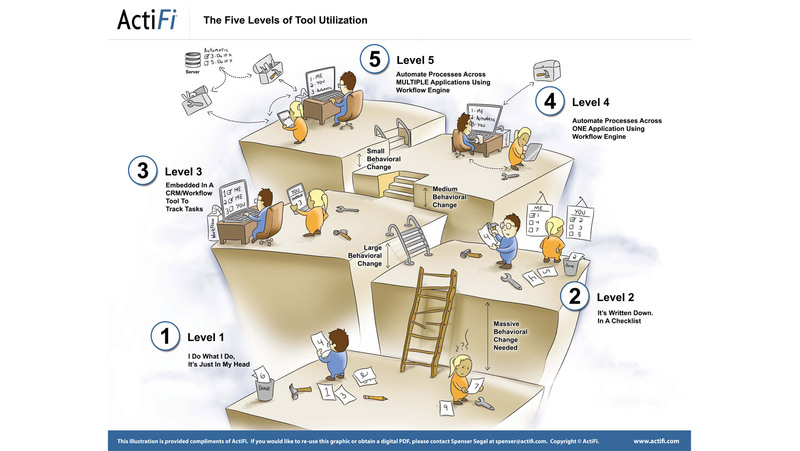 Look at the Five Levels of Tool Utilization diagram below and you’ll see this is the easiest transition we’ve covered since this journey began. While functionality differs from CRM to CRM, there are a number of common elements; a task framework, a workflow functionality to connect tasks together, and reporting. These will all be put to use when building your processes into the CRM system and when you are extracting information going forward. Just as with the checklists developed in Level 2, once your process is embedded into the CRM, you will want to test it with a subgroup of users. Similar to a checklist, it may take a couple of iterations to fine-tune the workflow. Once everything is flowing through as planned, it is time to roll it out to the entire team. 1. The Change: Work can be distributed among team members by assigning tasks to them in CRM instead of through verbal requests, email, and sticky notes. This benefits all users by making it clear that a request for action has been made, the time requirements are documented and it is not easily lost or deleted. Users can see all tasks assigned to them and are then better able to manage their workload and ensure timely completion of requests. No more sorting through multiple inbound formats and hand written notes to keep track of what is most important. 2. The Change: Status of assigned tasks is always visible and easily tracked by you, your management team, and the people responsible for completing them. This benefits all users by minimizing the need for constant verbal check-ins and status meetings. Instead, everyone can see which tasks are complete, on-track, or at risk of delay. Management can focus its attention on potential issues and workers are less likely to feel micro-managed. 3. The Change: History and results are at your fingertips because your data is consistent and in a single location. This benefits all users by eliminating the need to search multiple sources of information and trying to remember things that were done several days, weeks, months, or even years ago. Reports are easier and faster to produce with increased accuracy and you have data to help you identify areas of opportunity. So that is Level 3, embedding process into CRM. You can see with the few key points covered that your entire team benefits. In our next post in this series, Spenser Segal on Software Optimization, we’ll discuss Level 4 Utilization, where we take you into the realm of systemization and automation.